Take one look at these colors and you’ll feel cooler! Yep, I continue to be obsessed with the August heat and this palette is refreshing! Pool Party and Not Quite Navy are a great combination and the addition of So Saffron works perfectly. When I see blues and yellows together, I tend to think “French Country” so that is what I started with as a foundation for my card. I stamped the big flower image from Elements of Style in Pool Party onto Very Vanilla card stock. After some debate on the layout, I opted for a tried and true look. 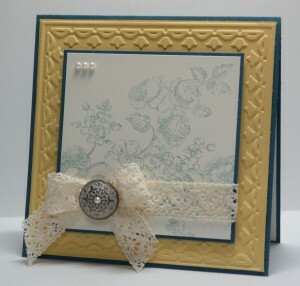 The Framed Tulips Embossing Folder makes another appearance but as a square (I love how that it can do that!). I wanted to add a few little touches but not get too fussy. Victoria Crochet Trim to the rescue along with some Basic Pearls. I added a additional little pearl to the Antique Brad for continuity. I guess this is sort of French Country meets Clean & Simple. 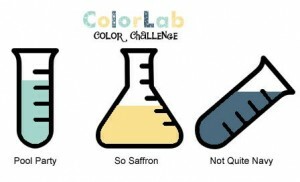 I can’t wait to see what you do with the colors this week. Thanks for stopping by and I will see you again soon! I still believe there’s never an ugly card with that set, and yours is striking. Love the country french feel. Beautiful color combo and beautiful card. WOW! Love this card! So refreshing! 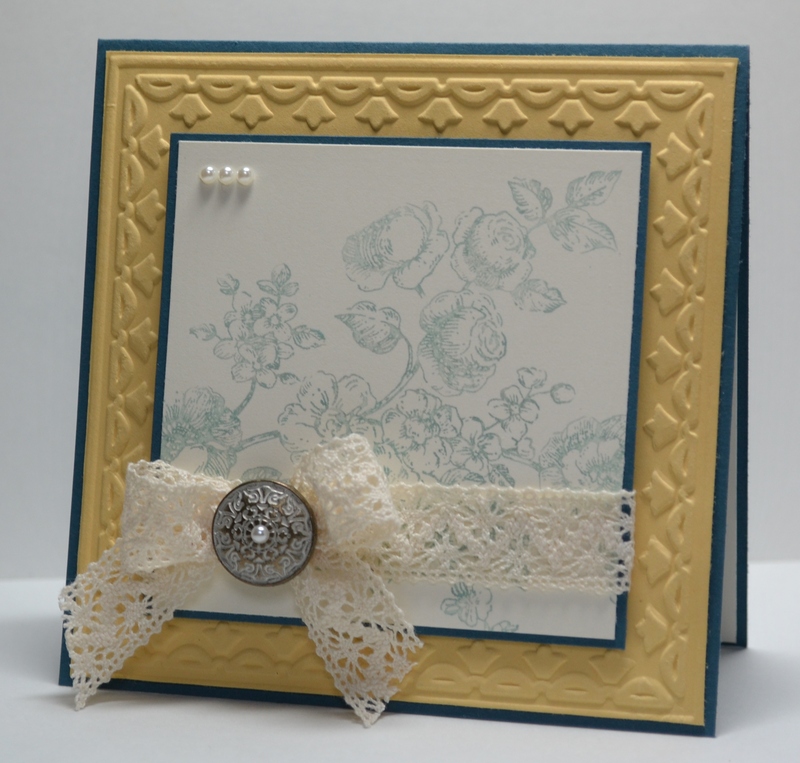 So love that set… beautiful job with the embossing folder!! REally sets off the the center image. Good job!! Very pretty Jen! Perfect use of the colors. Great card!! Such a lovely card! Great use of the colors! So soft and so elegant. Love how you did the Framed Tulips in a square.